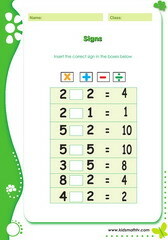 1st grade math worksheets, PDF for children in first grade to practice, addition, number sense, subtraction, mixed - operations, division. Learn to add 2 and 1 place numbers on this math worksheet. 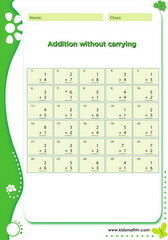 Addition of 1 to other numbers activity worksheet. 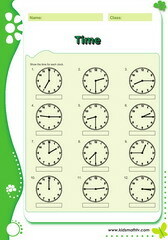 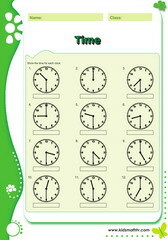 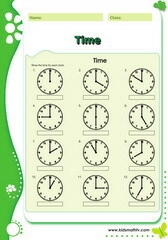 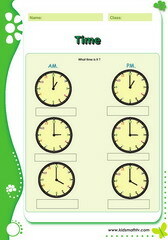 Adding numbers two times math activity, printable worksheet. Addition of double place numbers math worksheet - PDF. 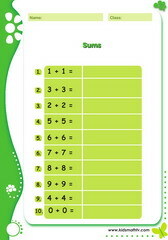 Addition of numbers to get sum of eight e.g. 5 +3, worksheet. 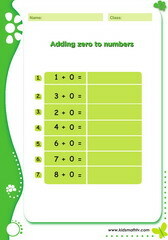 Addition of zero to other numbers e.g. 2 + 0, worksheet . Adding single place numbers up to 20, e.g. 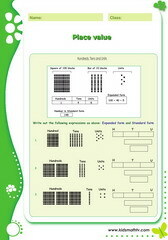 9 + 8 etc worksheet. 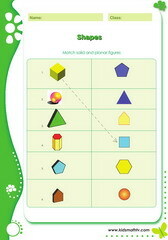 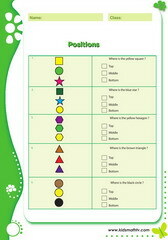 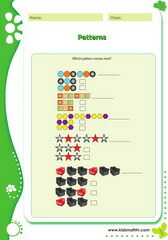 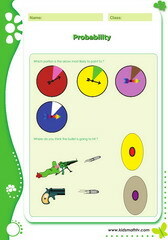 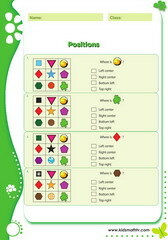 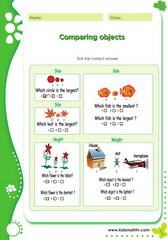 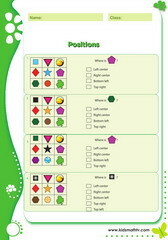 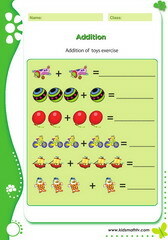 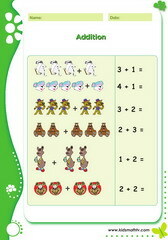 Addition applied in daily life, of toys and objects- math worksheet. Adding numbers with carrying 1st grade worksheet. 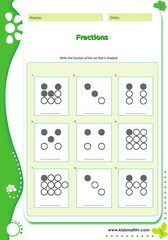 Addition with pictures, putting together to get sums - math worksheet. 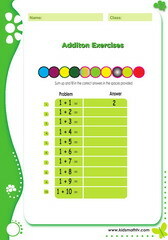 Addition word problems practice, with this worksheet. 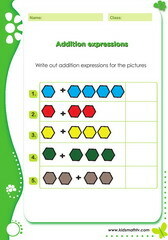 Addition expressions with pictures, e.g. 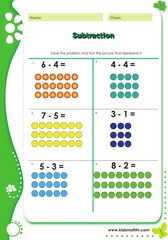 which picture shows 1 + 4 ? worksheet. Addition of numbers in a horizontal arrangement activity worksheet, PDF. 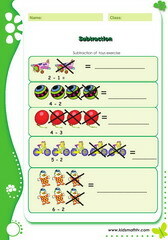 Addition of numbers with or without carrying activity worksheet. 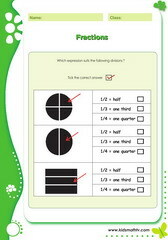 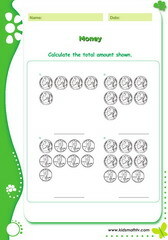 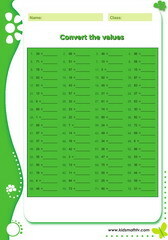 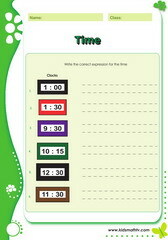 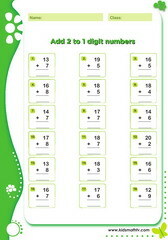 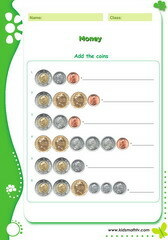 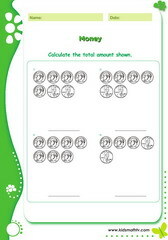 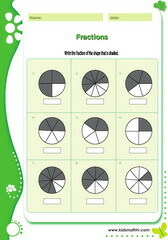 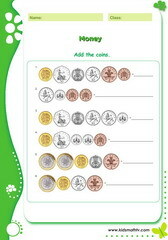 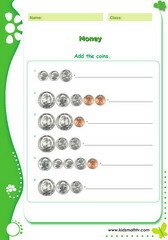 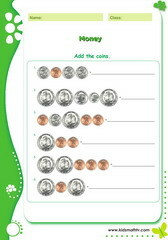 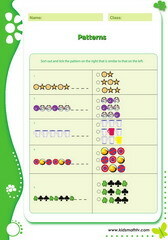 Addition of small numbers worksheet for 1st grade kids. Addition of three numbers worksheet for first graders. Practice addition of single digit numbers vertically arranged, math worksheet. Finding sums of numbers problems in sentence word problems,math worksheet PDF. Summing up numbers math worksheet for 1st graders. 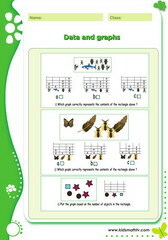 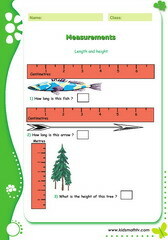 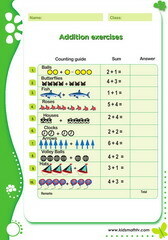 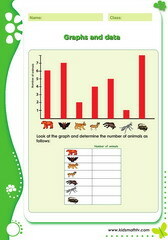 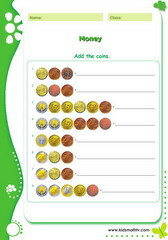 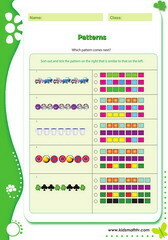 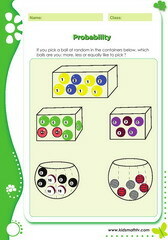 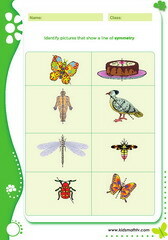 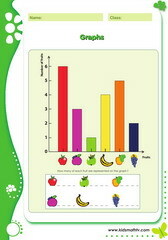 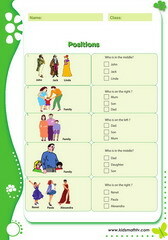 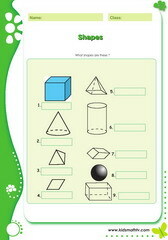 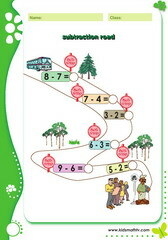 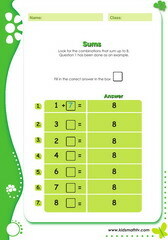 Learn addition with word problems about daily activities, worksheet PDF. 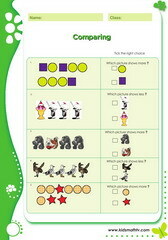 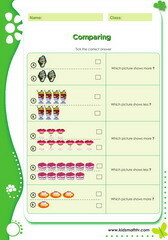 Practice comparison, more, less, equal with picture aids on this worksheet. 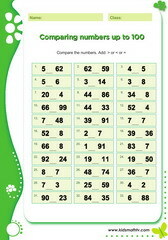 Learn to compare numbers 1 to 100 problems, math worksheet. 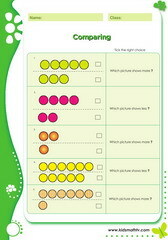 Comparison of numbers from one to ten, math activity worksheet. 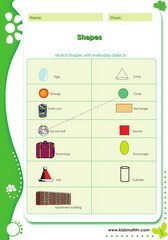 Study comparison of numbers & objects applied to daily life. 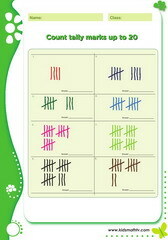 Learn to count using tally marks up to twenty with this worksheet. 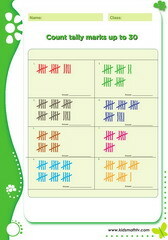 Learn to count with tally marks to 30 with this worksheet. 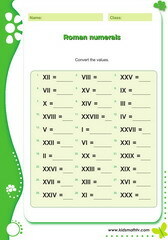 Converting Arabic to Roman numerals activity worksheet PDF. Practice counting and finding missing numbers with this math worksheet. Counting and finding number positions, before, after, & between - worksheet worksheet. 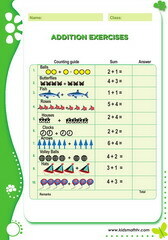 Counting by ones and twos skills math activity sheet - PDF. 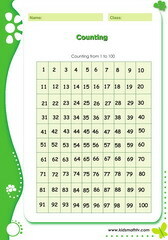 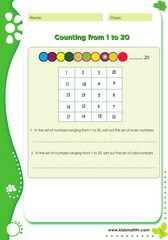 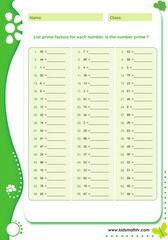 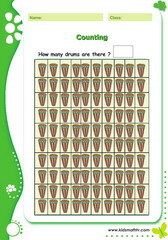 Counting up to 100, numbers skills math worksheet. 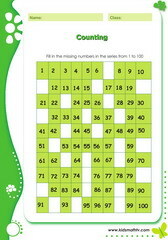 Counting up to 100 while finding missing numbers in a series. 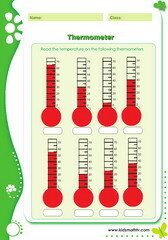 Counting from 1 to 100 with numbers, tracing, spelling, PDF worksheet. Practice ordering and classifying numbers with this worksheet. 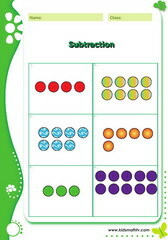 1st grade math worksheets for children in first grade to practice: addition, number sense, subtraction, mixed - operations, division, converting Roman and Arabic numerals, reading time on clocks, spelling numbers, word problems, geometry and shapes, place values, comparison and classification of numbers, Venn diagrams, Fractions etc. 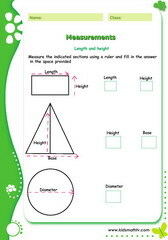 These activities are in pdf format meaning users can print out unlimited number of copies and could be an excellent idea to make ebooks or workbooks which kids can use to supplement their course.